Q.Presenting so many Rossini operas, particularly the less-often performed ones at a regional opera company is quite an ambitious project. What inspired you to do so? A.The dimensions of our theater in Albuquerque NM are very similar to those in Pesaro. Our house seats almost 700 people. So smaller scale works function best. Our pit can comfortably hold your average Rossini opera (Tell will be pushing the limits, but it’s still possible). So I always tell people that the audiences that first heard these works, heard them in a setting not unlike ours in NM. Intimacy is key. Rossini was not originally intended to be heard in a 4,000 + house. We first started with Cenerentola, which lead us to do l’Italiana in Algeri. The response to L’italiana was incredible. That season, it outsold La traviata. So we decided to go forward and plan Il barbiere di Siviglia (something safe) and Otello with the premiere of the lieto finale in addition to the standard tragic finale. The Otello was really an event that helped put us on the map. On opening night we performed both endings, and then every subsequent performance the audience voted on which ending they wanted to see. This turned out to be quite a thrilling theatrical experience, because people did not know what was going to happen until they saw it onstage. One is used to going to a Shakespeare tragedy and, more or less, knowing the outcome. But we though, what if the outcome were more uncertain? What if it were not only uncertain, but you could personally have a say in the fate of these characters? If that were the case, then you would be much more emotionally invested in the drama. So this was an enormous success for us and we ended up selling out all the performances. After that we took a little break in Albuquerque from Rossini, but just recently brought it back with Il turco in Italia, Tancredi, and coming this October Guillaume Tell. 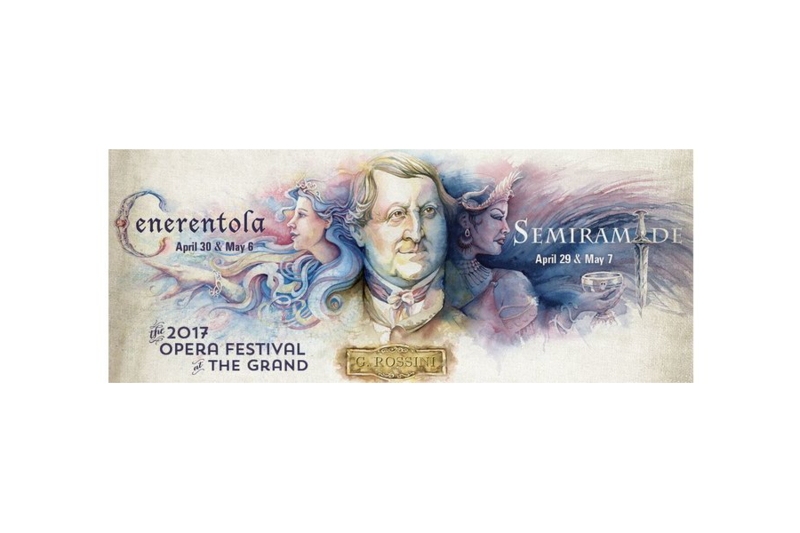 As for Opera Delaware, they are exploring themed seasons, and last year we did operas with libretti by Boito, and because of my connection with Rossini, we decided to do La cenerentola and Semiramide this year. The dimensions of the opera house in Wilmington Delaware are also extremely conducive to producing this kind of theater. Q.Singing Rossini is quite a challenge for many singers because as someone recently said “There is no place to hide”. How do you find singers willing and able to sing these roles? A.I find that because of our intimacy, and the fact that our orchestra pit is so deep, that we rarely run into the problem of the orchestra overpowering the singers. Which means that we can afford to hire younger singers, that have the agility to maneuver the coloratura, but whose voices maybe aren’t big enough to be in some of the larger houses. That’s the real trick with Rossini. Your voice has to be able to move. And most voices that move really, aren’t necessarily the loudest voices, and the loudest voices, sometimes have trouble moving. So again, it comes down to the fact that the “limitations” of our theater are actually beneficial to producing this kind of music. Q.Do your musicians need to make an adjustment? After all Pagliacci is very different from Semiramide in its orchestral textures. A.Somewhat with the later works. The earlier works are very lightly scored, but as Rossini’s music became more and more dramatic, he used more of the louder instruments. From the very beginning, Semiramide was criticized by contemporaries as being “too thick” in the orchestration. There are parts that seem very heavy to our ears, and he’s writing music f or even ff and when you have 4 horns plus 2 trumpets plus 3 trombones it can get a little overwhelming. Guillaume Tell is in many ways more lightly scored, even though it’s his “grand” opera. So there are going to be a lot of dynamic adjustments made in Semiramide to insure that the singers are always heard. And that’s not even taking into account the fact that in Rossini’s time a trombone wasn’t anywhere near as loud as it is today. Q.What has been the audience reaction to these Rossini operas? Do they embrace these works with enthusiasm, or does one hear “ Too bad it wasn’t Barbiere” as has been reported at some larger houses in this country? A.Especially with his real masterworks like Otello and Tancredi, the reaction has overwhelmingly been “why are these works not done all the time?” As great of an opera as it is, I do think audiences tire of Il barbiere di Siviglia. When they hear other works they hear everything they love about Rossini, but in new and fresh musical and dramatic situations. I do believe that we’re living in the middle of a Rossini Renaissance in America. His serious works have never completely fallen out of the repertoire in Europe, but more and more companies in the states are exploring the opere serie. In addition to our survey at Opera Southwest, the Santa Fe opera has done La donna del lago, and Maometto II, and the Met now does Le comte Ory and Guillaume Tell. Q.Why do you think that Rossini is not as popular as Verdi and Puccini in the US? A.I think a lot of this goes back to the over-success of Il barbiere di Siviglia. Barber is so popular that it has completely overshadowed his other works. I also believe that our sensibilities when it comes to “tragic” or “serious” opera are very different now than during Rossini’s time. Puccini and late Verdi seem somehow more “natural” and less “formulaic” both musically and dramatically, than Rossini’s serious works. I’m not saying those works are more natural, I’m just saying that they appear that way to modern sensibilities. Rossini lived at the very end of the Classical era and into the Romantic era, much like Beethoven who was, more or less, his contemporary. While his later works like Tell have a decidedly more Romantic flair to them, he was clearly a child of the Classical era, and probably was more aesthetically in line with the likes of Mozart. And to be fair, Mozart’s “serious” works are only now getting their due. There were decades in America where nobody did La clemenza di Tito and Idomeneo, but now with a lot of early music being resurrected, it’s not so odd for an opera audience to see this kind of more stylized element added to serious opera. We also tend to unfortunately equate “serious” with “tragic,” and, with the exception of Otello, (and the tragic ending of Tancredi), most of Rossini’s “serious” operas are far from the bloodbaths of Verdi and Puccini. They tend to have more noble endings, oftentimes with a moral, and very firmly in line with enlightenment ideas of dramaturgy. Otello was the piece to really break that mold, and unfortunately Rossini’s Otello has been overshadowed by Verdi’s, even though it is a masterwork on its own, worthy of much more attention. Q. What has been your musical inspiration? For example, what inspired you to become a musician, and who are the artists that have influenced over the years. A.This one could go on and on. Let me think about it. I have so many different avenues of musical interest, that to condense it down for something like this might be a task that would bore your readers to tears! Thank you, Maestro Barrese for sharing your thoughts! Be sure to check out Delaware Opera’s 2017 Festival at www.operade.org. ← Tributes to Alberto Zedda continue .